Description An internal description of the Role. Is Required There must always be at least one Member in this Role at any time. Receives Confirmation Emails This Role recieves a copy of any Confirmation Emails sent to members of the same Organisation. An Organisation Role can have multiple Members assigned to it, but each Organisation Member can only have one Role assigned to them. A role that is marked as "Is Required" *must* always have at least one Member assigned to that Role at any one time. This is suggested for Admin Roles. If you want to remove someone from an "Is Required" Role, you must make sure that there is at leaset 1 other person in that Role before you are allowed to remove them. 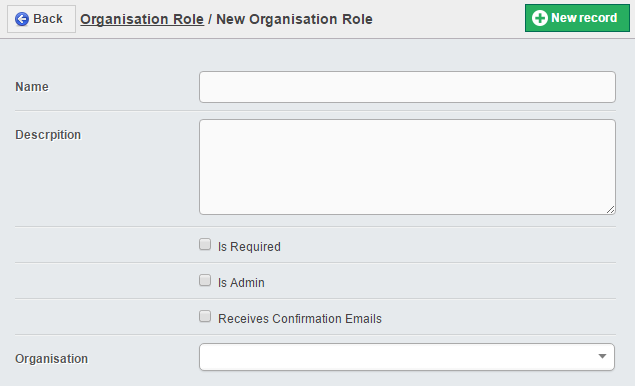 Organisation Roles can be set up to recieve a copy of all Confirmation Messages from members of the same Organisation. Additionally, Organisation Roles and Organisation Admins can be included as a Message Recipient from within the settings of a Notification. Documents which are uploaded to a Organisation Member's Customer Profile can be set to be shared to members of the same Organisation (Public) or only to Organisation Admins (OnlyToAdmins). See the Manual page on Documents for more details.